"Doctor, I have the worst headache of my life." Those words send up a warning when a doctor walks into a room to see the patient. The textbooks say that this symptom is one of the clues that the patient may be suffering from a subarachnoid hemorrhage (brain hemorrhage) from a leaking cerebral aneurysm. These words don't mean that a disaster is waiting to happen, but the red flag is waving. If those words are associated with a patient who is lying very still, complaining of a stiff neck, and has difficulty tolerating the lights in the room, this makes the suspicions rise even higher. Add vomiting and confusion as associated symptoms, and the sirens are going off in the doctor's head. Something bad is happening and time is critical. There are four major blood vessels that supply the brain: two carotid arteries, right and left, that are located in the front of the neck and two vertebral arteries that are located in the back of the neck. They join together at the base of the brain forming an arterial loop known as the Circle of Willis, and from there smaller arteries deliver oxygen-rich blood to the far corners of the brain. There is a potential that one of the connecting points of those four major arteries can be weak. Over time, the artery wall can start to bulge and form an aneurysm, a small sac-like bulge. One day, or maybe never, this aneurysm can leak and blood can escape into brain beneath the meninges (the membranes that line the brain). Blood is very irritating to tissue when it is outside blood vessels, and that leaked blood can cause the severe headaches and irritation of the meninges, causing a stiff neck. 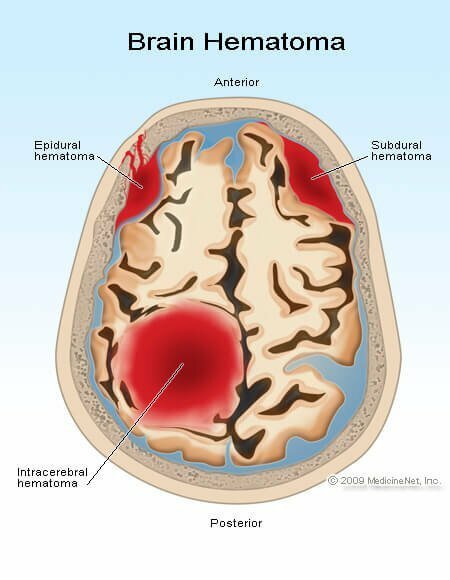 Usually, the first subarachnoid bleed isn't a killer. Instead it is a "sentinel" or warning headache and, if recognized, the aneurysm might be found and repaired. If it's missed, the next bleed can be catastrophic and fatal. The diagnosis begins with the doctor's suspicion of a problem. Not all severe headaches are due to bleeding, strokes, or brain tumors, and it's the skill of the health care practitioner to decide whether testing needs to be done. A CT scan of the head is the first test and the most likely test to find the diagnosis, but on occasion (much lower than 5% of cases), the scan is normal. In this case, if the suspicion is still high, a lumbar puncture might need to be performed, though with higher tech CT scanners, there is some controversy regarding the need for this testing. Because the blood leaks into the space that connects the brain to the spinal canal containing cerebrospinal fluid (CSF), blood in the CSF can establish the diagnosis if the CT is normal. In some hospitals, CT angiography may replace lumbar puncture as the next step to be done. Cerebral aneurysms may be lethal if not treated. The initial leak of blood may cause the first "worst" headache, but a neurosurgeon or an interventional radiologist may treat the aneurysm with application of a clip or coil to prevent the next catastrophic bleed. Sometimes, people go through their whole life with aneurysms and they never cause a problem. Why one person gets sick and another doesn't is always a tough question to answer. "It's the worst headache of my life" is black and white; either it's an aneurysm or it isn't. Why a person becomes ill and why today -- instead of yesterday, tomorrow, or never -- is a tough philosophical question and even tougher to answer at the bedside. Fauci, Anthony S., et al. Harrison's Principles of Internal Medicine. 17th ed. United States: McGraw-Hill Professional, 2008.